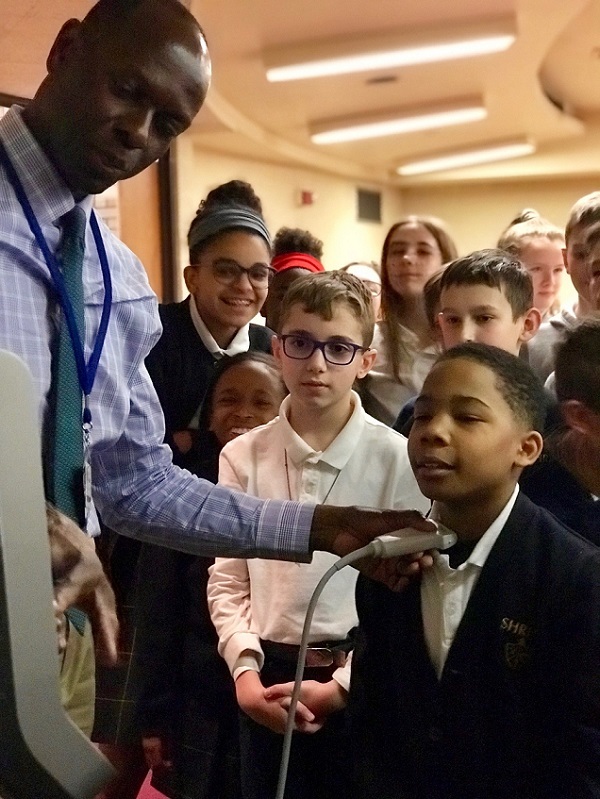 Assistant Professor of Emergency Medicine David Amponsah, M.D., uses an ultrasound wand on a sixth-grader during STEM Day 2019. The Warrior community welcomed 2,500 students and teachers to Wayne State University on March 12 for its annual exploration of science, technology, engineering and mathematics. School of Medicine faculty members were among the WSU staffers who educated and entertained sixth- through ninth-graders and their teachers with hands-on, interactive experiments and activities. Each group of students were assigned two of nearly 80 sessions covering a range of STEM studies and career opportunities. Sessions were staffed by WSU faculty, staff or students from the School of Medicine, College of Liberal Arts and Sciences, College of Nursing, College of Engineering and more. Medicine-related programming including “Fingercasting,” which demonstrated the process of casting a broken bone; “Taking Vitals and the Human Heart,” in which first- and second-year medical student volunteers showed students how to measure vital signs and record their own values for their health records; and “The Diagnostic Capabilities of Point-of-Care Ultrasound,” which included an introduction to normal anatomic structures using ultrasound, how it is used bedside to impact clinical decision-making, and a hands-on look at using an ultrasound machine to see inside the body. The latter session was taught by Assistant Professor of Emergency Medicine David Amponsah, M.D., an Emergency Medicine physician and director of EM Ultrasound Education and Fellowship at Henry Ford Hospital in Detroit. “We use ultrasound for everything,” he told the young visitors. He presented a brief slideshow on imaging, and also showed the students ultrasound images of their heart, carotid artery, tendons and liver. “Is anything wrong with me?” one sixth-grader from Royal Oak’s Shrine Catholic Grade School timidly asked Dr. Amponsah while looking at ultrasound images of his neck. The students enthusiastically thanked the doctor after each session. “Even the parents got involved. The hands-on part really solidified it. I love to teach, so it turned out to be even better than I expected,” Dr. Amponsah said. STEM Day was created three years ago to inspire participants to pursue a STEM degree in college and prepare for an exciting career in one of these world-changing fields. In addition to the morning sessions, attendees experienced Wayne State through campus tours and a complimentary lunch. STEM Day 2019 was free and open to teachers with their classes as well as individual virtual and home-schooled students.